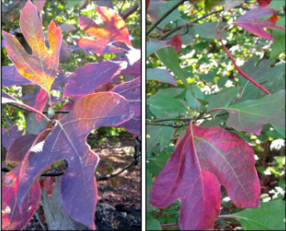 Sassafras offers three-season interest: globelike clusters of chartreuse flowers in spring, leaves with three distinct shapes, dark blue fruit in red cups in summer, and foliage ranging from orange to crimson to purple in fall. This native is common in wood edges throughout the Mid-Atlantic Region except for the northern border of Pennsylvania. This entry was posted in MG in the Garden, Tried and True Native Plant Selections for the Mid-Atlantic and tagged Sassafras albidum, Tried and True Native Plant Selections for the Mid-Atlantic. Bookmark the permalink.